1 funny weddings | This Blog Rules | Why go elsewhere? Have you ever been to an unlikely wedding? Maybe the bride is beautiful. Perhaps the groom is unfortunate looking. However, those supposedly strange unions have nothing on these 7 most unlikely weddings in the world. Read on and be amazed. When you read the name Erika La Tour Eiffel, we’re sure you can guess who or, ahem, what she married? That’s right; this former soldier’s life partner is a famous French landmark. According to reports, she almost became Erika Berlin Wall. That is, until the Eiffel Tower finally won her heart. “I take me to be my husband and wife.” Liu Ye wanted to show his “dissatisfaction with reality.” Is there a better way of doing this than by marrying yourself? Heck, no. 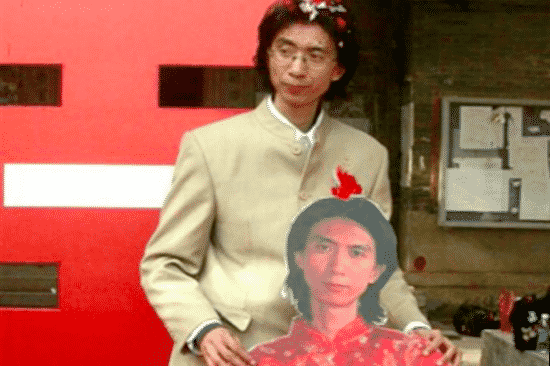 The guy turned up at the unlikely wedding ceremony with a cardboard cut out showing himself in a dress. Nice. You guys know what it is like when you’re really into a computer game, don’t you? Yeah, you do. Don’t be coy with us. Well, multiply this feeling by a million times and you should know what this guy’s life is like. A man from Japan with the rather mysterious moniker, Sal9000, got married. Strangely, his unlikely bride was a character from a video game. Even more bizarrely, she has a more believable name than the human in the relationship; Nene Anegasaki. 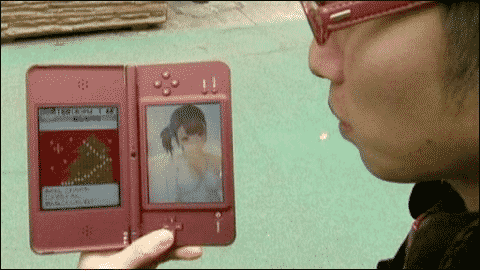 She is a star of the Nintendo DS classic dating game, Love Plus. They got married in Guam. It seems that this kind of thing isn’t as uncommon as you may think. Charles Tombe made a mistake. He paid a heavy price for it. Our intrepid hero was feeling a bit frisky and made an awful mistake. In Sudan, you are forced to marry a woman if you are caught having relations with her. 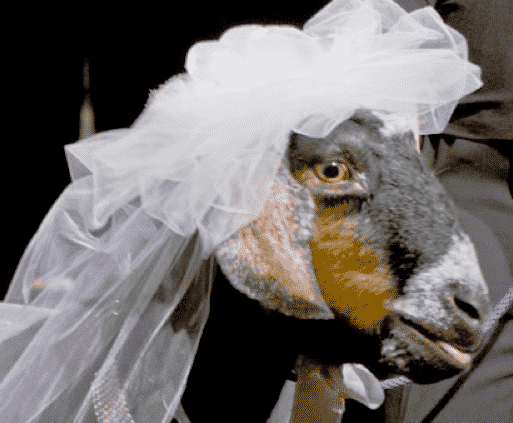 In the case of poor Charles, the same law resulted in his caprine wedding. This next one isn’t funny at all. It’s actually quite sad. You see, Jonathan George was killed in a traffic accident just before his marriage to Magali Jaskiewicz in France. 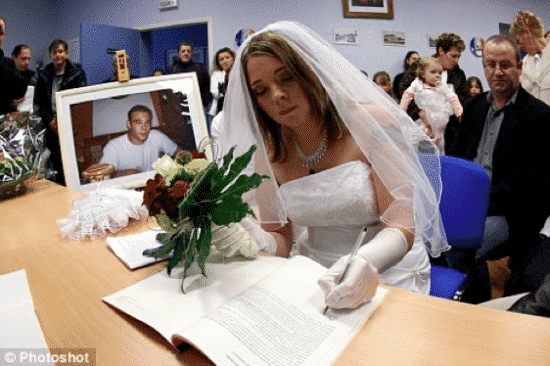 Thankfully, the French law allows for posthumous weddings if you can prove that you were about to get married before the death. It has been claimed that about 10 of these unlikely weddings take place each year. When you think of the comfortable wedding night this guy probably had, you’ll realize he is probably the smartest person on this list. 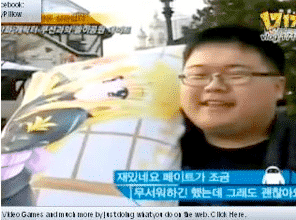 Lee Jin-gyu married a pillow in 2010. Hang on before you start judging! The pillow has the image of a popular anime character on it. That makes it sound a bit less insane. I guess. This unlikely wedding unfortunately hasn’t yet happened. But, we sincerely hope it does soon. 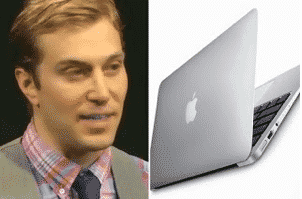 Chris Sevier likes his computer. No, he really likes it. In fact, he loves that darned piece of machinery. He loves it so much that he wants to marry it. Chris would like to love and honour it until a busted hdd do them part. This marriage proposal was not so surprisingly turned down by authorities in Utah. Chris has challenged the decision. Perhaps one day, he will be able to kiss his computer bride in front of his friends and family.